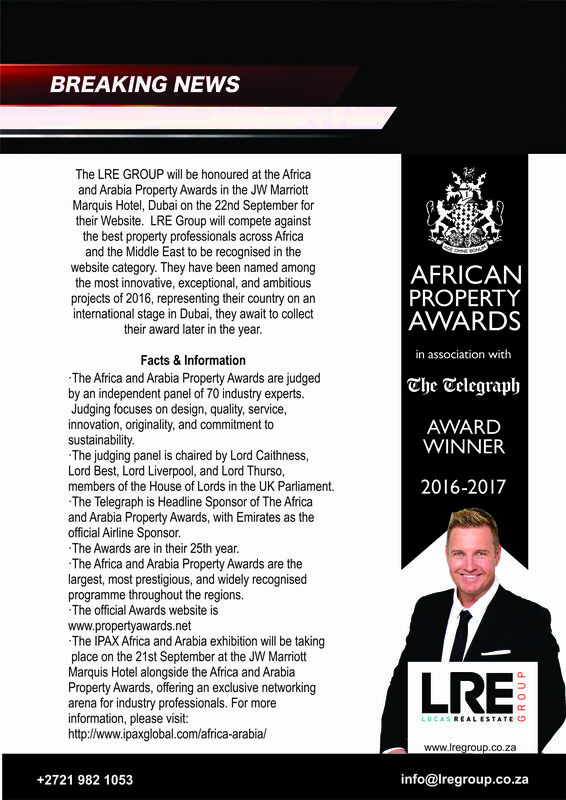 The LRE Group will be honoured at the Africa and Arabia Property Awards in the JW Marriott Marquis Hotel, Dubai on the 22nd September for their Website. LRE Group will compete against the best property professionals across Africa and the Middle East to be recognised in the website category. They have been named among the most innovative, exceptional, and ambitious projects of 2016, representing their country on an international stage in Dubai, they await to collect their award later in the year. The Africa and Arabia Property Awards are judged by an independent panel of 70 industry experts. Judging focuses on design, quality, service, innovation, originality, and commitment to sustainability. The judging panel is chaired by Lord Caithness, Lord Best, Lord Liverpool, and Lord Thurso, members of the House of Lords in the UK Parliament. The Telegraph is Headline Sponsor of The Africa and Arabia Property Awards, with Emirates as the official Airline Sponsor. The Awards are in their 25th year. The Africa and Arabia Property Awards are the largest, most prestigious, and widely recognised programme throughout the regions. I want to be part of a winning team. Congratulations LRE on the achievement.